This is a shoot we did for ITV Creative. We love working on Bull and Cattle shoots and have over the years done perhaps 50 – 60 such shoots. Always very demanding in terms of preparation and safe execution but it is always really enjoyable and rewarding to work with such wonderful, characterful animals. Some photographers like to shoot all-in-camera for that authentic-trigger-finger-moment feeling. Others, in order to ease the logistics of a particular shot may decide to use more technology and shoot the different elements separately putting everything together in post production. Either way, A-Z Animals provides and supervises animals for photography that precisely dovetail with the photographer client’s preferred modus operandi. A-Z Animals has provided and supervised animals for still photography on over 6000 occasions. Each stills shoot dictates its own specific dynamics, characteristics, working environment and modus operandi. 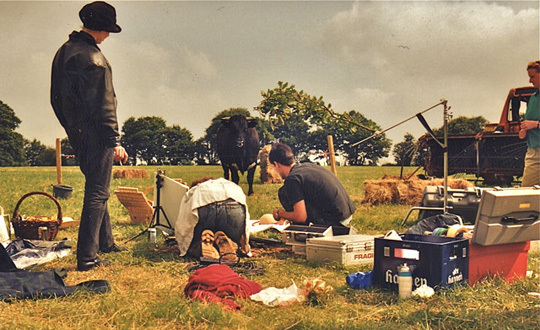 This Bull In A Picnic Field photograph has been shot with that authentic-trigger-finger-moment approach. That is to say, everything in-camera – foreground picnic complete with Fortnum & Mason picnic cloth, upon which is placed a smoked salmon on a silver platter, a beautifully chopped Italian tomato salad with Ciabatta on the side and of course that ice cool German beer in an authentic frosted bier keller glass, which is paying for this little outing – all of this under a blazing early summer’s Hampshire afternoon sun. Oh yes of course, there’s one more element in-camera; the one and a half ton Gloucester Bull glaring at the eye of the lens who’s wondering “who are these guys in my private field”? When you do a stills shot like this in-camera, you need to be very sure of the temperament of your bull. In order to be very sure you need to be hugely experienced with bulls so that you can read and understand their individual temperament in specific circumstances. A-Z Animals provides and expertly supervises the best animals for film, television, photography, PR and special events.